Since 1859, the Island Hotel has weathered the storms of coastal Cedar Key. Generations have sipped a beer on a hot summer day and dined on speckled trout fresh off the boat. Its weathered facade seems steadfast, a survivor of the Gulf of Mexico’s whims. The thriving inn and restaurant is on the National Register of Historic Places and draws townsfolk and tourists alike. Its place in history is secure, but its place in the next century may not be, and so University of Florida researcher Morris Hylton III points a laser scanner at its walls, documenting it millimeter by millimeter in three dimensions. The images are ethereal, and in a world of rising seas, perhaps the ghosts of Florida future. The work is part of the Resilient Resources Initiative, and Cedar Key is a pilot before Hylton and his graduate students move on to the 9 square miles of historic districts in Miami’s South Beach, and perhaps other coastal communities. A 2014 estimate puts 720 of 1,007 UNESCO World Heritage sites at risk from sea level rise. 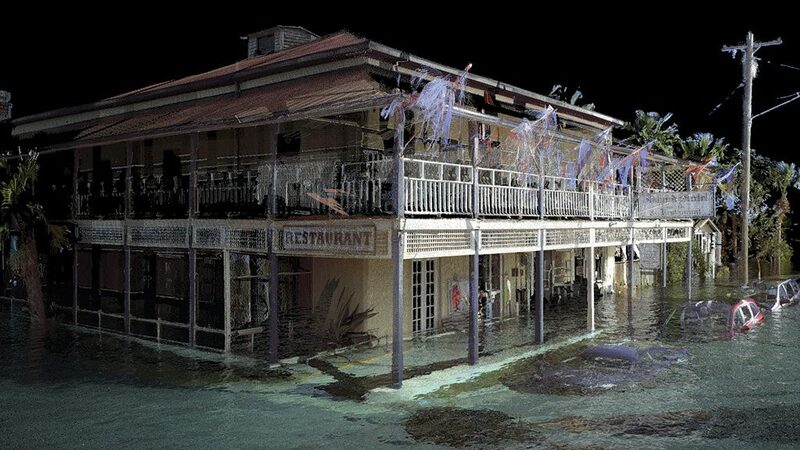 There is no survey of threatened heritage along Florida’s 1,350 miles of coastline — although almost any Floridian can name a favorite iconic site — and Hylton says that was the impetus for the Resilient Resources Initiative, a collaboration of the Envision Heritage Program and the GeoPlan Center in UF’s College of Design, Construction & Planning. Hylton says the laser scanning technology gives coastal communities accurate documentation of their heritage as a tool in making the hard choices ahead. UF’s laser arrived in 2012, and now the university is a leader in using the technology for historic preservation. Through the National Center for Preservation Technology, the National Park Service contracts with UF to train heritage specialists to document threatened sites, and Hylton’s team has been to Thailand and Myanmar to document temples. When Hylton aims the laser at a historic site, a point cloud takes shape in 3-D. The virtual model consists of millions or — depending on the size of the site — tens of millions of tiny points that record the x, y and z coordinates when the laser hits the surface. The files are large, and Hylton says UF’s supercomputers, HiPerGator and HiPerGator 2.0, have been pressed into service for data management. HiPerGator’s keepers welcomed the opportunity to work on large visual datasets as opposed to traditional datasets of numbers and words. For an archive, digital files are a challenge, Hylton says. Data stored on floppy disks in the 1990s, for instance, is not easily accessible today. The laser works fast, and speed is what Hylton needs with the sea rising, steadily in some places but unpredictably in others. He estimates it would take a day and a half to document a structure the size of the Castillo de San Marcos in St. Augustine, for instance. 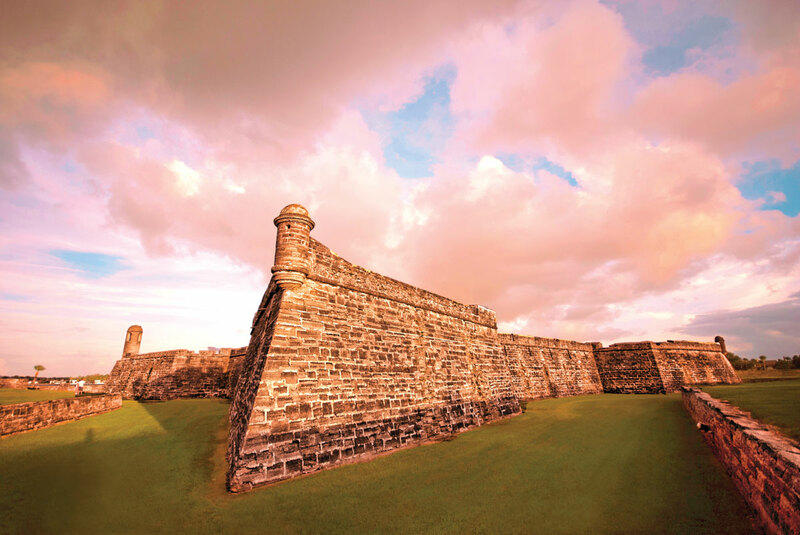 The Castillo is the oldest masonry fort in the continental United States, at 321 years old. Although it never fell to an enemy in battle, it is slowly succumbing to the sea. The technology is as accurate as it is powerful. When interiors of the former Steinway & Sons piano company in Manhattan were demolished to make room for a residential tower, Hylton’s team scanned the decorative plaster ceilings. Using the scan, the American College of the Building Arts in Charleston, S.C. recreated some of the details by hand with traditional methods. “We went from analog to virtual and back to analog,” Hylton says. Recreating something larger requires a cost-benefit analysis. A U.S. Department of the Interior study of just one-third of the national parks threatened by sea level rise estimated $40 billion in resources are at risk. The study noted that rebuilding the Castillo farther inland — with its original coquina blocks and tabby mortar — could cost billions. The National Park Service has partnered with UF to provide training and workshops on using the laser to document its sites. The World Monuments Fund, too, has called upon UF to document fragile resources. Hylton says that when he worked for the fund before coming to UF the enemies of historic preservation were largely decay, neglect, even development. Today, water is by far the major threat. At Wat Chaiwatthanaram, a riverside Buddhist temple in the Khmer style in Thailand, Hylton’s team was invited in following flooding that damaged the foundations of the temple and towers. 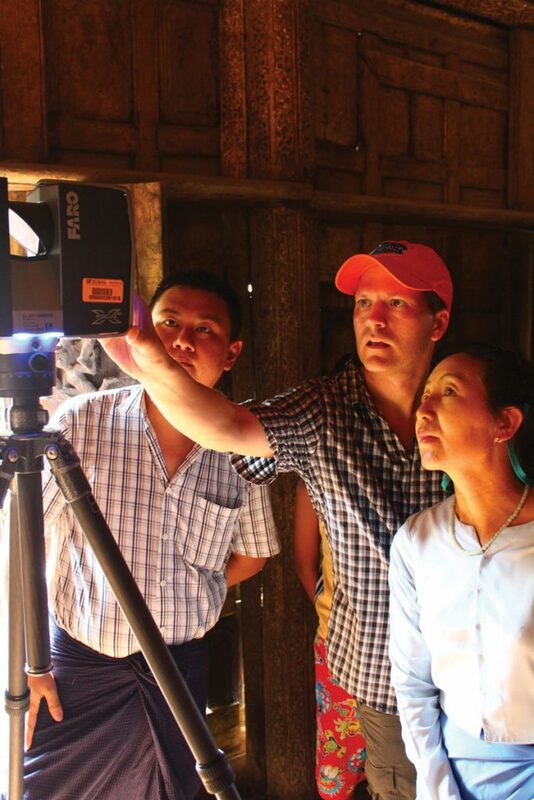 Hylton demonstrates laser scanning at a Buddhist monastery in Myanmar. Some sites have turned to mammoth engineering to keep rising water at bay. Venice, Italy just completed the Moses project, a series of gates to block the highest tides in the lagoon, at a billion-dollar cost. As he prepares to document Miami’s South Beach and its art deco treasures, Hylton wonders if generations to come, more accustomed to virtual worlds, may turn to the scanned images as a memory bank of sorts. In a future, virtual world, perhaps they can even enter digital images, for a stroll along the ramparts of a fort built by Spanish conquistadors or through the lobby of Miami Beach’s Fontainebleau hotel, or into Ernest Hemingway’s home with its six-toed cats in Key West. “Nothing can replace visiting a place, being there, but the fact is we’re going to lose a lot of places, and if they can somehow experience them that’s a huge benefit from what we’re doing,” Hylton says. Hylton has dedicated his career to historic preservation, and says the prospect of what Florida, his adopted home, might lose exacts an emotional toll that is hard to describe. At the same time, he feels an urgency to deploy technology, to do what he can.